The Face Shop, the Korean brand known for its skincare and makeup, has released a few sets for Christmas, and one of the sets (which I predict is is going to be pretty popular, if it isn't already!) is The SMIM Fermentation Concentrate Special Set ($69.90), which consists of bottles of The SMIM Fermentation Concentrate Total Treatment, The SMIM Fermentation Concentrate Toner, and The SMIM Ferementation Concentrate Emulsion. If you're wondering what SMIM stands for, it's apparently a shortened way of the Korean phrase "seu-myeo-deul-da", which means to absorb and penetrate, which is what the products are advertised to do. The SMIM product line consists of Yeast Ferment Extract, which apparently is the feature ingredient here. The Face Shop SMIM Fermentation Concentrate Special Set: Just in time for Christmas, too! And apparently, I've been told by other bloggers at a previous Face Shop event sometime back (and documented on my Instagram) that apparently, The SMIM Fermentation Concentrate Treatment is very similar to the fabled SKII Facial Treatment Essence, although I've no idea if that is true or not. I suppose that is where all the similarities to SKII come about - after all, SKII has their story about Pitera too (I have to file that Pitera thing for another post - I've been getting some friends asking me whether pitera really works). But in any case, you can see why the product set is going to sell well - aesthetically speaking, these are lightweight, lotion-formula products that feel great on the skin, and the Yeast Fermentation concept, are definitely attractive to consumers. The comparisons to SKII can't hurt either! So, I thought it's high time I did my review on this, seeing that Christmas is approaching. I've been so caught up this holiday season that I haven't been blogging about the Christmas things as much as I'd like, but I thought this was worth a review! And of course, we're going to review this my style, and start at my favourite part of the product - the ingredients lists! If you look at the ingredients lists, you'll see that right at the top of the SMIM Fermentation Concentrate Treatment, (and also included in the other two products, the Toner and Emulsion), is the ingredient Yeast Ferment Extract. I take it as a good sign that the Yeast Ferment Extract is the first ingredient on the Treatment ingredient list, because it means The Face Shop has been advertising honestly, because the yeast is actually there in significant amounts (I can't tell you how many products I've seen advertise feature ingredients that aren't actually present in meaningful amounts in the product). That said, I'm sure you're wondering: What exactly is this yeast in my skincare, and what does it do for my skin? First of all, let's settle the question of what this Yeast Ferment Extract is. After all, there are many species of yeast, and not all of them are friendly to humans! There's the genus Saccharomyces, which includes Saccharomyces cerevisiae, the common yeast used in baking and alcohol production (it works by converting carbohydrates into carbon dioxide and alcohol), there is the genus Cryptococcus, which includes C. neoformans which is pathogenic to humans, and then there is the genus Candida, which occurs naturally in ladyparts but can also cause infection. Unfortunately the specific yeast species doesn't seem to be named, but we can hazard an intelligent guess as to what species is used. The most likely candidate is Saccharomyces cerevisia. This is because 1) it's a pretty common form of yeast, which might explain why it's labled just "yeast" on the ingredient list rather than its proper species name, 2) this seems to be the most common yeast used in skincare - Paula's Choice has an article devoted to it (and she further notes that it reproduces well, which is partly why it's commonly used in skincare products), and 3) there seem to be no shortage of companies supplying Saccharomyces cerivisia in various forms for use in cosmetic ingredients - a quick search on Prospector, an industry database of ingredients and chemicals for personal care products, turns up over 200 results, including from some big-name companies like Ashland, Lonza, Clariant and so on. A number of these ingredient suppliers also supply plain ol' yeast for baking and alcohol too, and 4) science-wise, this seems to have more research behind it. So now that we're assuming that it's most likely Saccharomyces cerevisiae that we're putting on our skin, what does it do? That's also where I again got a little stumped, but because there isn't much published science on what Saccharomyces cerevisiae can do for your skin. Of course, this doesn't mean there is no research - it could be that the research is conducted by the manufacturers of the ingredients and not published for intellectual property reasons. But in terms of looking up the science, a lack of published research isn't the ideal outcome. Paula's Choice assigns yeast the possibility of antioxidant properties (with some caveats), but when I looked up the science, I didn't find that much about yeast having antioxidant properties. Most of the literature I came across seemed to indicate that yeast extracts could help in wound healing - in mice, in horses, and also in human ulcers. There is also some evidence that yeast could have anti-inflammatory properties. A neat little summary of yeast and its medical uses is available here, although it doesn't talk about topical use on skin. So there you go - there is some evidence that yeast when applied topically to skin, could aid in wound-healing, and have anti-inflammatory properties too. So, now that you know what yeast does for skin, let's continue our ingredients analysis! I'll also talk about my own experience with the products at the same time, too. 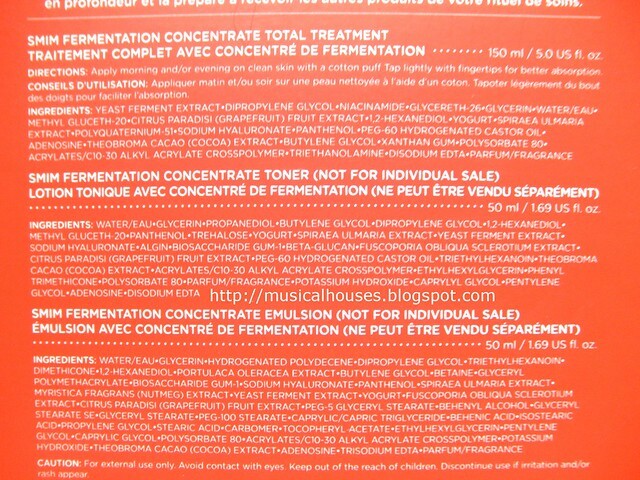 We'll start with the SMIM Fermentation Concentrate Treatment. The first ingredient is Yeast Ferment Extract. After that, there are ingredients that are emollients (Glycereth-26, Methyl-Gluceth-20, which also has humectant properties), humectants (Glycerin, Sodium Hyaluronate, Butylene Glycol), and functional ingredients like slip agents (Dipropylene Glycol), emulsifiers (Polysorbate 80, PEG-60 Hydrogenated Castor Oil), film formers (Polyquaternium-51), thickeners (Acrylates/C10-30 Alkyl Acrylate Crosspolymer) pH adjusters and rheology modifier (Triethanolamine, Xanthan gum), and preservatives (1,2-Hexanediol). I'm pleased to also see the inclusion of Niacinamide, also known as Vitamin B3, fairly high up in the ingredients lists, since it can improve skin elasticity and skin's barrier function. You also sometimes see Niacinamide in whitening products, too, because it can also help with skin discolouration. There are also some plant extracts (Grapefruit, Meadowsweet, Cocoa), which I'm pretty indifferent to - some people's skin can be irritated by plant extracts, but some are fine with it, and depending on your skin type you might like or dislike them. Interesting too is the inclusion of Yoghurt as an ingredient, and I'm honestly not sure what it does - perhaps it's a substrate or a source of carbohydrates for the yeast. I'd welcome anyone who can shed light on this! So after looking at the ingredients lists, you would expect a light-textured product that sinks into the skin pretty fast, judging by the choice of humectants and emollients. 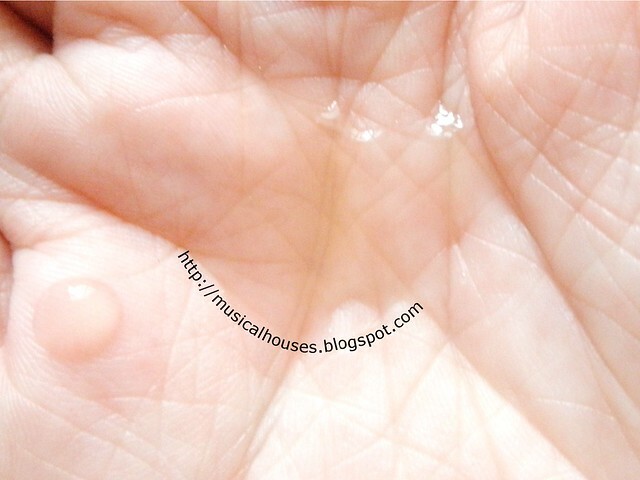 And indeed, I found that this had a light, watery texture, that also absorbs fast without leaving any residue on my skin. This was quite similar to a lot of Japanese-brand face lotions that have been popular lately, and I think for good reason - it feels pretty moisturizing without being heavy, and in this hot and humid climate, lightweight products tend to be pretty popular. Next, we take a look at the SMIM Fermentation Concentrate Toner. You'll see some similarity between the ingredients in the Toner and in the Concentrate Treatment, owing to the use of the same humectants, emollients, preservatives and other functional ingredients. It's primarily composed of Water and humectants (Glycerin, Propanediol, Butylene Glycol, Biosaccharide Gum-1, Sodium Hyaluronate) and has some emollient properties (Methyl-Gluceth-20), as you might expect a toner to be. But the ingredients list looks pretty long (for a toner anyway) because there are a bunch of other functional ingredients in there like slip agents (Dipropylene Glycol), thickeners (Acrylates/C10-30 Alkyl Acrylate Crosspolymer), pH adjusters (Triethanolamine), preservatives (1,2-Hexanediol) and the like. Of course, Yeast Ferment Extract and Yoghurt also make an appearance, and the same plant extracts are there too (Grapefruit, Cocoa), although Fuscoporia Obliqua Sclerotium Extract is also new (it's basically a type of mushroom). Interesting here is the inclusion of Algin, which we don't see in the Concentrate Treatment. Algin is a brown algae, and in cosmetics, these can be used variably as thickeners, emulsifiers, or humectants, and Beta-Glucan, a form of sugar that could have anti-inflammatory properties. As you might expect with a toner, this is light, water, absorbs fast, and doesn't leave behind any residue. Like the other SMIM Fermentation Concentrate products, this has a sweet, citrus-herbal kind of scent that isn't too cloying and is very pleasant. The scent dissipates pretty fast across all the products, so it didn't bother me. Lastly, we move on to the SMIM Fermentation Concentrate Emulsion. Again, some of the ingredients are similar across the SMIM range. The product has water, humectants (Glycerin, Butylene Glycol, Sodium Hyaluronate), emollients (Triethylhexanoin, Hydrogenated Polydecene, Caprylic/Capric Triglycerides), and also has emulsifiers (Betaine, PEG 5 Glyceryl Stearate, Glyceryl Stearate, Glyceryl Stearate SE), film formers (Glyceryl Polymethacrylate), thickeners (Behenyl Alcohol), and other functional ingredients. Again, Yeast Ferment Extract and Yoghurt also make an appearance, as do plant extracts are there too (Grapefruit, Nutmeg, Meadowsweet, Mushroom, Cocoa), although Fuscoporia Obliqua Sclerotium Extract is also new (it's basically a type of mushroom). Some of the functional ingredients are also familiar, like slip agents (Dipropylene Glycol), thickeners (Acrylates/C10-30 Alkyl Acrylate Crosspolymer), emulsifiers (Polysorbate 80), pH adjusters (Triethanolamine), preservatives (1,2-Hexanediol) and so on. As with most of the SMIM Fermentation Concentrate line, the humectants, emollients and other ingredients chosen generally are quite light and pleasant-feeling, so you would expect this to be also a fairly lightweight moisturizer. And yes, this is a light, gel-textured moisturizer that does indeed feel light on the skin. It does leave behind a slight residue on the skin (it doesn't sink in totally and disappear), but it doesn't feel too oily or sticky. While it's lightweight, it does help to moisturize the skin. So all in all, would I recommend this? I'd say that overall, this is a set of products that do indeed contain significant amounts of Yeast Ferment Extract, particularly in the SMIM Fermentation Concentrate Treatment, where it is the first ingredient on the list, which could provide anti-inflammatory and wound-healing benefits. The entire range is formulated to moisturize the skin with humectants and emollients, and also to do so while being lightweight and non-greasy on the skin, and there are also some good ingredients that stand out as good to the skin, or interesting because you don't see them that commonly in skincare products (Niacinamide, Algin, Beta-Glucan, Yoghurt), making the product different from other similar offerings on the market. If you think that a skincare with yeast interests you, and you are looking for a set of products that hydrates without feeling heavy or oily on the skin, this is a good choice. And as a Christmas gift, these are pretty great too. These look presentable, with a really pretty Christmassy box, and the size of the products is generous, and the products are interesting enough to sustain the attention of a skincare lover. The Bottom Line: The SMIM Fermentation Concentrate Treatment has meaningful amounts of yeast, is formulated to moisturize without feeling heavy, and has some interesting ingredients that set it apart from its competitors. Sounds interesting. Even if yeast doesn't actually do anything major, the other ingredients are still pretty credible. In what order would you use each of these? Awww...this is a good gift idea this Christmas. These are great products and it has a very Christmas packaging. Love it! Thanks for the review! Right now I just have the toner and that's expensive enough, but I love it. You're completely right about the smell, it's very pleasant.